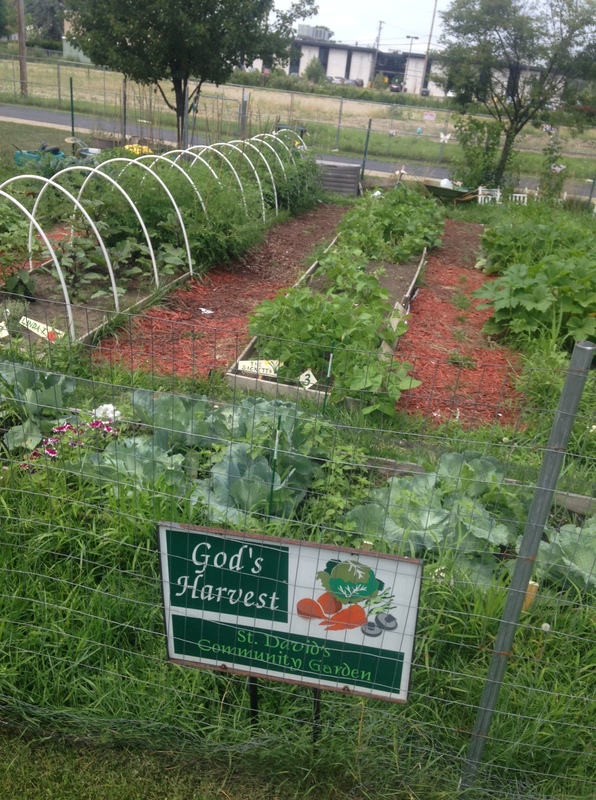 St. David’s, Southfield is one of many churches in our diocese offering an impressive garden. With all the tragic news that has filled our lives lately, I am sorely tempted to post photos of cute kittens and puppies this week. I think we all need a break. However, while we might rest and hide for a while, life continues to go on and our neighbors still have needs to which we must respond. Resolved, that this Convention call on dioceses, congregations, and all the baptized to increase our involvement in advocacy for the development and maintenance of sustainable; equitable; culturally appropriate; and accessible food systems. Since this is such a foundational concern, I thought I might highlight just a few of the ministries around our diocese that are responding to food security. 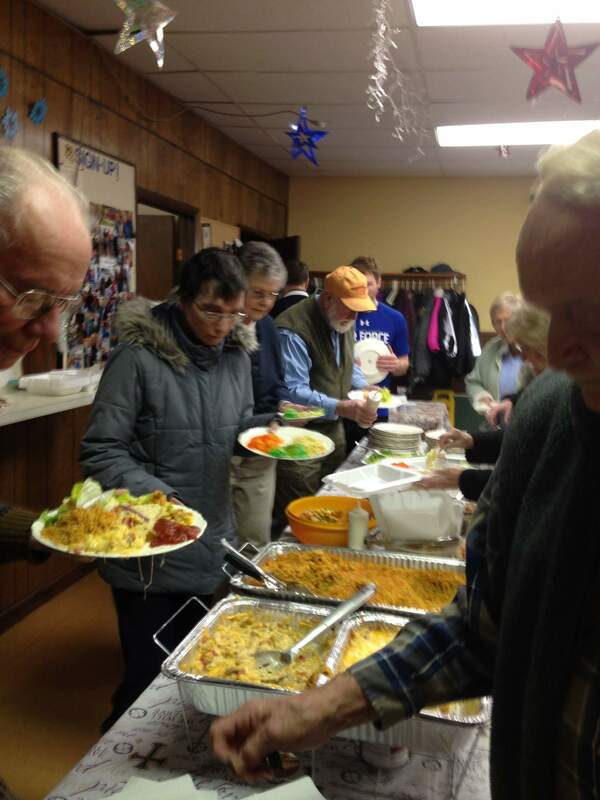 Ten years ago, the small congregation of St Peter’s in Hillsdale started hosting a free community supper on the third Friday of every month. The first year, they fed approximately 35 guests a month. 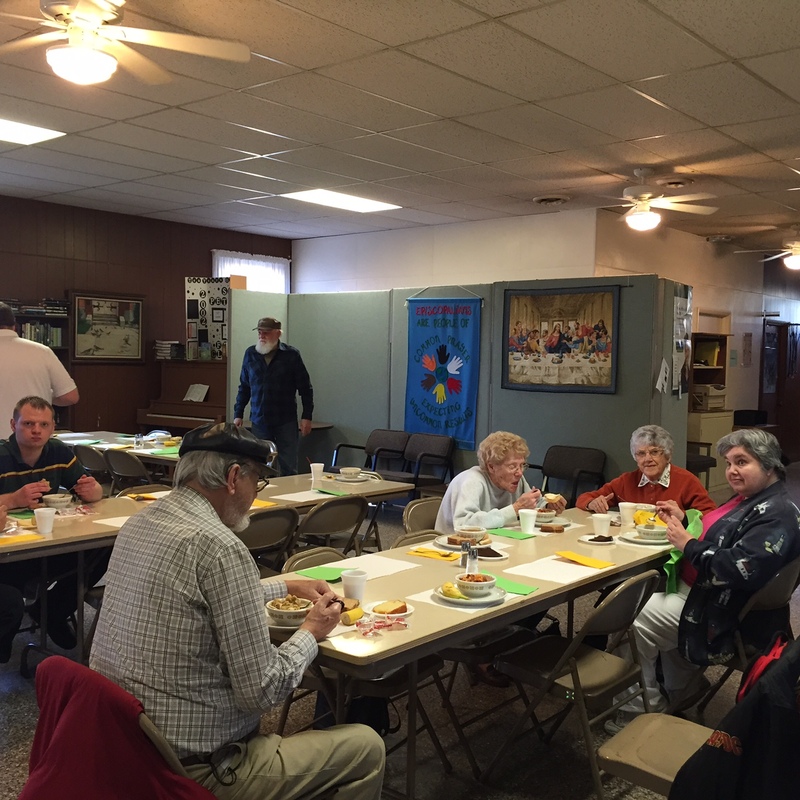 The next year, three other ministries in Hillsdale came on board to provide a free meal every Friday from September through May. Attendance went up to an average of 70 guests each week. The churches that are currently joining in this work are First Presbyterian Church of Hillsdale, One Step Ministries, and St Anthony’s Roman Catholic Church. At St Peter’s, the guests are treated to a variety of homemade soups, bread, desserts, fruit and plenty of good, hot coffee. Volunteers come from each congregation as well as from Hillsdale College and members of the community. It has been a great time of good food and fellowship for all that serve and attend. The community dinners are a response to the many we saw as underemployed, unemployed and the homeless in the Brooklyn area. We felt that a home cooked dinner would be a welcome event, even though we might only offer it monthly. We began advertising a free meal but got a very limited response. Thinking that people might want to pay something, we settled on a $2 donation….At first we had too much of a response: 180-200 people and we collected $800-$900 at the first few dinners. Since we can only seat about 90, we needed to “turn the tables” as they say at Outback. We found that people wanted to remain to talk and fellowship. In the last two years, we are reaching our “target” people, those with families, grandchildren and retired couples on limited income. John told me that the money they have collected has helped pay for some much needed repairs to their building and has also gone to support the Brooklyn Food Pantry. Since March, the member churches of the Wyandotte Ministerial Association has been referring people to us on days when the Downriver Food Pantry is not open, which has increased our visibility. Just since the beginning of July, we’ve given 240 pounds of food to 13 families. Members of the congregation are asked to bring specific items in particular each week, though extra items are always welcome. We are working on partnering with other local organizations to increase our level of donations to meet the need. 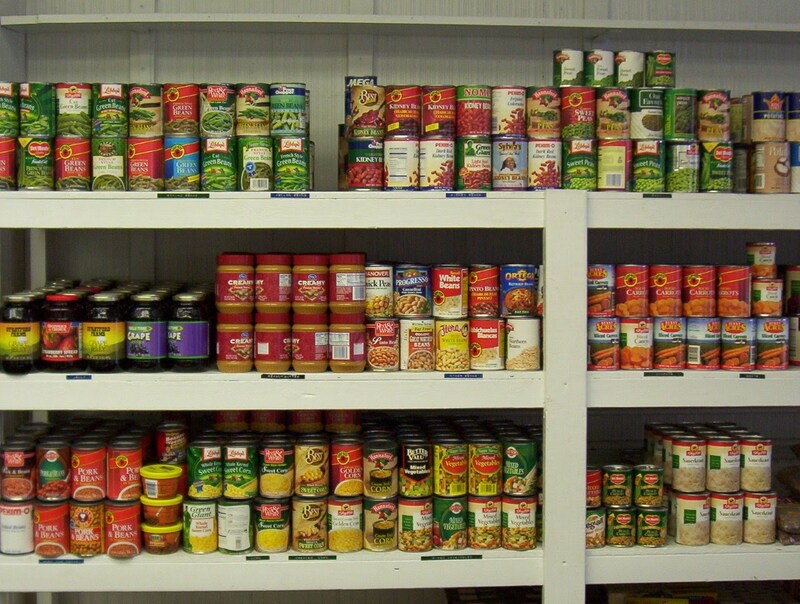 The pantry is open Monday, Tuesday, and Thursday from 9 am – 2 pm and by appointment. For more information, people can call 734-284-8777. St Stephen’s summer food program for children runs in conjunction with the Wyandotte Ministerial Association. They have worked with two federally-funded food programs. From mid-June through late, volunteers pack and distribute sack lunches on Wednesdays to children participating in the city recreational programs in the parks. Members of the congregation also serve at the Presbyterian Church to serve a hot lunch from mid-June through mid-August. The Blessings in a Backpack program (http://www.blessingsinabackpackmi.org/) provides a backpack full of food to elementary and some junior high kids so that they have nutritious food on the weekend. Over 900 kids get food from this program. Families receiving this assistance must qualify for free or reduced price lunch to be eligible. In 2007, St Barnabas Episcopal Church in Chelsea dug up their front lawn to plant a garden that might raise awareness to the food needs of the wider community participating in the “Plant a Row for the Hungry Program.” Their hope was that as they “planted their garden, they would also plant an idea” for others to emulate in their own yards or those of their churches. According to their website, they donated over 1200 pounds of produce to Food Gatherers (foodgatherers.org) during their first season!! Since then, they’ve “grown vegetables, collected produce from local gardeners, gathered canned and dry goods and staples, and donated over three tons of food to Food Gatherers, Hearts Community Service and Faith In Action.” One of their priests, the Rev. David Glaser, shared with me that they have also planted a Peace Garden with native plantings to help the pollinators and they have installed a rain collection system as a model of good stewardship of all creation. I know that there are other congregations in our Household that are actively involved in providing food security to our neighbors and friends. I will be pleased to tell your stories in future blogs if you share them with me at jschellhammer@hillsdale.edu. Tell me what your church family is doing and send photos, too! Writing the blog this week has been a delight because I’ve had the opportunity to hear the excitement in each voice as my friends have told their stories. Expressing love to those around us by sharing our abundance is life-giving for both the recipient and the giver! This is one more perfect example of how we can demonstrate love for our neighbors and in so doing express our love for God. you gave us an image of solidarity with the hungry, O Lord. you called all to the table, O Lord. and the healing of this world. so I may work with joy to serve your children. to recognize those in poverty. to feed your children in need. we may all break bread together. We ask these things in your Holy Name because we know you love it when we pray. Amen. And All Saints’ Pontiac has responded as well. 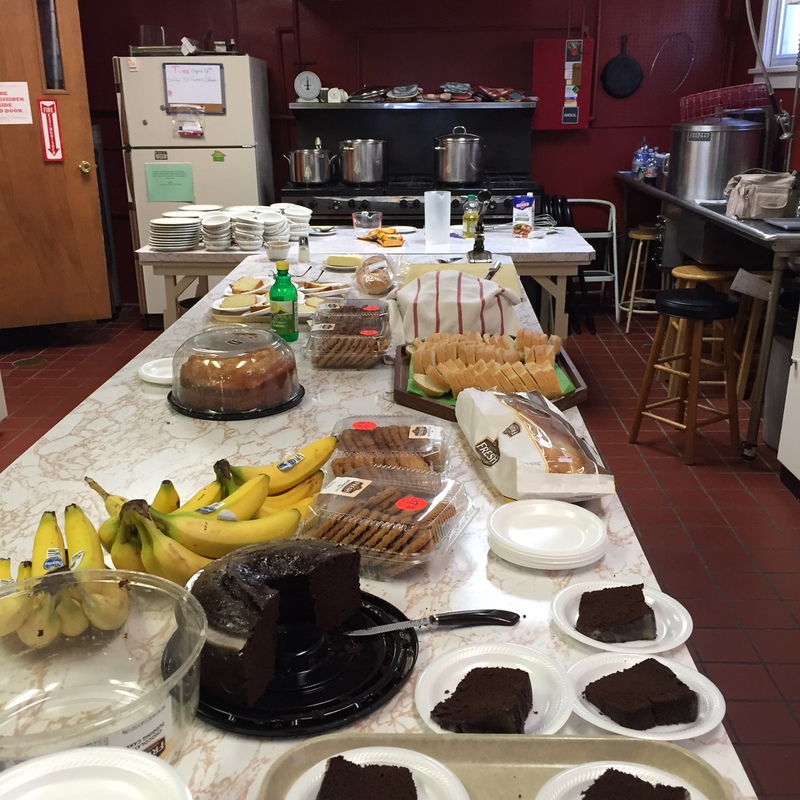 A free community breakfast every Saturday morning feeds 100+ people each week. Our Saturday Produce Market provides fresh fruits and vegetables at near wholesale prices to the people of the nutritional desert that is Pontiac.